A recipe for New Orleans-style bread pudding served with a whiskey sauce. Day old bread is used to make a delightful and comforting dessert. Place the bread in a large bowl. In a small saucepan, melt 6 tablespoons of butter and pour over the bread cubes. Use a rubber spatula to toss the bread and evenly distribute the butter. Grease a 9 X 13-inch casserole dish with the remaining tablespoon of butter and set aside. Combine the heavy cream, milk, eggs, brown sugar, vanilla, cinnamon, nutmeg, salt, and raisins in a large bowl. Whisk to mix. Pour the cream mixture over the bread and stir to combine. Allow the mixture to sit at room temperature for 30 to 45 minutes. Transfer the bread mixture to the casserole dish and bake until the center of the bread pudding is set, 50 to 60 minutes. 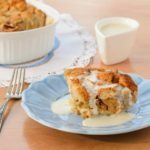 Garnish the bread pudding with confectioners' sugar and serve warm with warm Whiskey Sauce. In a 1-quart saucepan set over medium heat, combine the cream, milk, and sugar. Place the cornstarch and 1/4 cup of the bourbon in a small mixing bowl and whisk to blend and make a slurry. Pour the slurry into the cream mixture and bring to a boil. Once the sauce begins to boil, reduce the heat to a gentle simmer and cook, stirring occasionally, for 5 minutes. Remove the sauce from the heat, add the salt, and stir in the butter and remaining 1/2 cup of bourbon. Serve warm.